In combination with the MyRide-VX-Personal console, the IC7 indoor cycle offers a unique training experience. Besides the smart Coach-by-Color training control, now the landcape shootings of HD video quality as well as a training instructor, who accompanies you during many different class programmes and who is always a motivation, are additionally included. All in al, about 55 hours of video material of HD quality are available on the MyRide VX Personal console. All in all, about 3,300 minutes of HD videos are available on the MyRide VX console – that's about 55 hours of motivating video material, which mainly split up in three training zones. 500 route videos of HD quality and with a duration of 5 minutes were especially created for the MyRide VX console. You can cycle all these routes and compile an individual travel route with a playlist. The routes are categorised according to the incline profiles: ascent, descent, mixed, and flat. 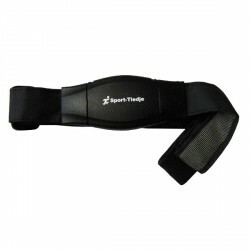 Thanks to the gym coach function, you sit directly face-to-face with the indoor cycling coach. The class is highlighted with typical cycling music and the coach gives instructions. There are three different class formats: Drills (15min), Fast-Class (30min), and Class (50min). All of them offer different training durations, training targets, and class structuring. All in all, there are 20 gym coach programmes: 12 Drills taking 15 minutes, 4Fast-Classes taking 30 minutes, and 4 Classes taking 50 minutes. The tour coach is a kind of sporty travel companion: In the video, it leads you on sporty bike tours across breathtaking landscapes. However, it's not only the landscapes, which are breathtaking, but also the instructions of the coach make sure that you will really run out of breath. The videos are highlighted with motivating, pushing music. All in all, there are eight training videos available: 4 Fast-Classes taking 30 minutes, 4 Classes taking 50 minutes. Besides the tablet control, the IC7 by ICG also offers the classic Coach by Color console. It is equipped with a five-colours system for displaying the intensity. The intensity you require is displayed in a certain colour. Hence, the indoor cycling coach is also already built in this console. Of course, you can also cycle in the manual mode - as usual. On the display, all training data are clearly presented. The resistance can be controlled with a smart 300 degree adjustment wheel. The resistance can be adjusted from 0 to 100 % by just one turn - and all other levels in between as well. The IC7 comes with an innovative drive system. For the IC7, the power of the pedals is transmitted to the flywheel in a two-stage system. Here, a high-quality Poly-V belt and a tooth belt are combined. Due to the big transmission ratio of 1:11, very big torques (power) can be transmitted and the flywheel is put to a very high number of revolutions. This combination results in a perfect power transmission and hence a much more comfortable cycling experience. In addition, a power metre is mounted on the intermediate shaft, which measures very precisely the operating power. Hence, an extremely high measuring precision is achieved - it is perfect for analysing the own performance and for a professional training control. 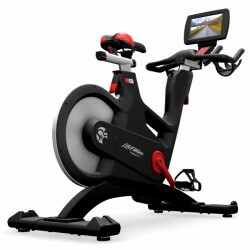 Life Fitness Indoor Bike IC7 MyRide VX by ICG til sammenligningslisten.